The newest installment in the SimCity franchise is now available - and it's global in scope. Technology in 'SimCity' has been updated along with forces influencing the health of cities and the happiness of inhabitants, according to Maxis. Along with rich 3-D graphics, the game will have a new simulation engine that enhances its realism and extends ramifications of urban design decisions past borders to affect neighboring cities. "Climate change is the biggest crisis of our time, but there is a disconnect because it is not in front of us," he added. "When you play 'SimCity' it is in your face; if you build a coal power plant you feel the consequences -- smog in the city, water table getting dirty, and your people getting angry." Twitter co-founder Stone described 'SimCity' as encouraging systems that help make "better humans, a smarter world and a healthier planet." Players become virtual mayors, guiding development of pretend cities and reaping rewards or suffering ramifications of decisions. "Their mission is to make a thriving, happy city," Erik Reynolds of EA said of the game on the eve of its release. "It you don't have enough schools, you will have uneducated Sims and uneducated Sims get up to no good." 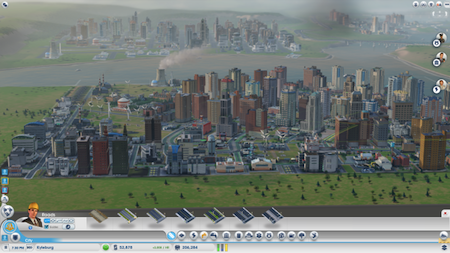 People can play SimCity solo, or establish in-game regions open where as many at 16 cities can be built by different players. The creator of the Sims, Will Wright, acknowleges that Stanislaw Lem's marvelous 1965 story The Cyberiad: Fables for the Cybernetic Age is one of the key inspirations for his software. Via ArsTechnica (this review captures AT editors commenting while using the game) and GMA News.